Office 365 uses AI as it focuses the inbox and filters out junk mail. What is AI? – Intelligence that is added to manchines to empower people and companies in new and exciting ways in work and life. Because computing power has moved to the cloud. We have made huge improvements in machine learning and so now AI is moving from the labs into what we can use every day. If you have intelligent technology, how can you make human beings be more intelligent? Application for those who are visually impaired, can use this to help connect to internet. Education – can use this data to identify pupils that are at risk of dropping out. Earth – Some of fastest growing populations in poorest parts. Need smarter farming. Farmbeats works with farmers in India to grow crops in smarter way. 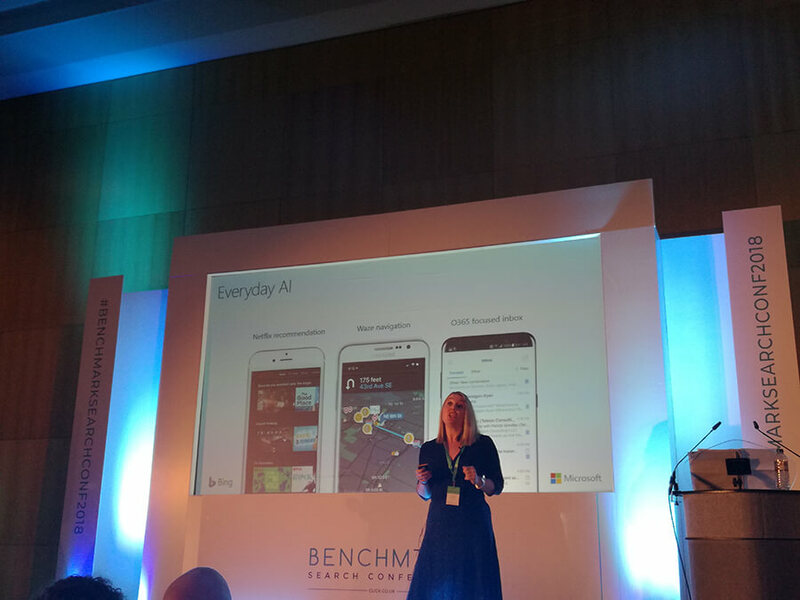 How does AI apply to BING? 1 – Visual search (search an image within an image). 3 – Predictive answer – can make intelligent predictions about ten poll events. Services – developers work on this. Great AI needs great data. Microsoft Graph has work knowledge and user knowledge. AI makes it important to do jobs. Automation and drive efficiency and reasoning. For marketers – user intent data for optimal performance, personalize advertising message, churn prediction modelling. For consumers – more intimate and relevant interactions. Receive the right information for that need. A chatbot can resolve up to 82% of customer relations. 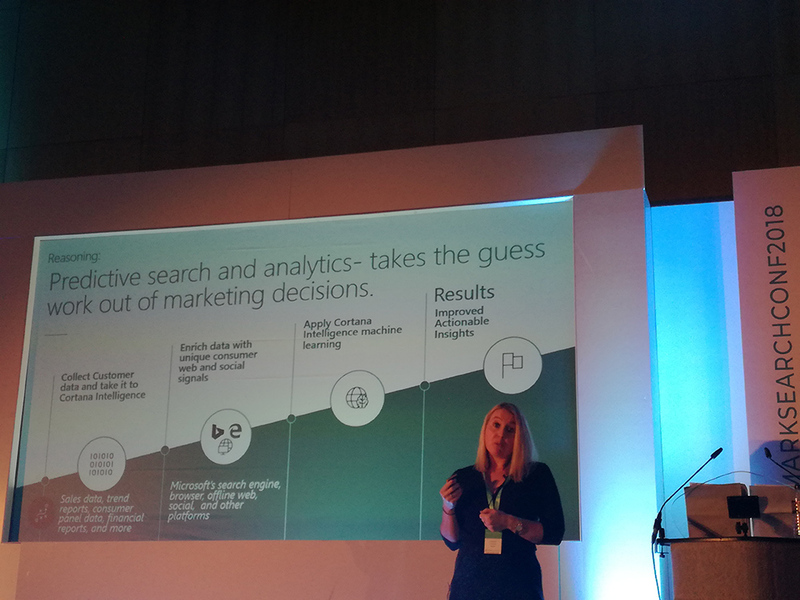 Reasoning – Predictive search and analytics, takes the guess work out of marketing decisions. Automation to drive effiicent and reasoning. Lee Wilcox, CEO On The Tools shared his experience of growing his company which he founded in August 2014. It was started on a Friday night with Lee and Adam (Lee’s best friend) talking about how they wanted to make a B2B app. They wanted to be able to connect subcontractors to contractors. Adam had been in the trade for 12 years and was looking for a plasterer. Set up a FB page as no money for a site. Wanted UK trades people in one spot. First video that made it for them was a video of a builder jumping in the mud. Put 40 GBP behind the video post. Then they had 3 million views. Then people sent Lee’s company their content. Then after 3 months they had 250,000 followers on Facebook.They grew an audience. What they needed to do is carry on the journey. Got 150 messages a day, most being about content. But likes don’t pay the bills. 6 months in, they had requests from many followers asking for merchandising for “on the tools”. They set up a shopify store. Top 6 trades, electricians, carpenters, asked audience to give the best slogans. In the first week, they generated 800 GBP of sales. This grew to 15,000 GBP in one month. 2 months after shop set up, took Adam to be part of the company full time. 2016 – the app came back from India. Had 500,000 followers on the Facebook page. Set to launch but the app didn’t work. March that year, 3 months on, lost a licensing partner distributing content through. March lost 24k. So what was next? They needed someone with time and experience to come it. A former colleague came on and worked with them and Adam. Andy came on. By Sept 2016 hit 1million FB likes. Then made content for two companies, called Juice and the other called Jewson for free. Juice is a company that helps get apprentices into work . Lee and his team made video content for this Juice and Jewson. Then they got approached by a company to make their own awards. Voted by tradespeople. There was nothing about , I mean out there for trades people. Eg power brand of the year. Start 2017, they got 3 brand partnerships long term. Scrufffs hardwear, Direct line, Jewson. Humor was a way to disrupt the market. More male following. 18 – 24. These guys are on site every day. Biggest piece of content was for Direct Line, highest viewed content in UK. Posted before Grand National. Now they are a social media marketing agency. App never launched. 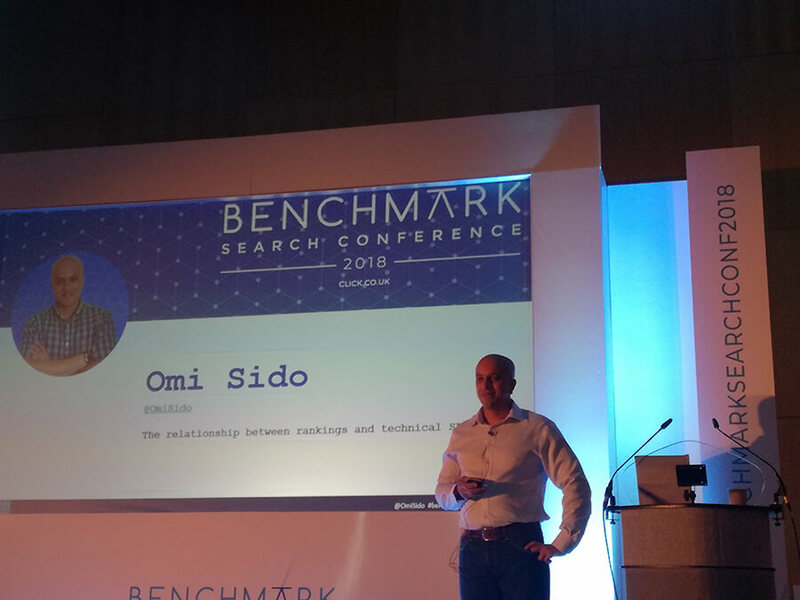 Omi Sido, Senior Technical SEO, Canon Europe was next up at Benchmark Conference. Omi has been working in technical SEO in last 4 or 5 years. If you apply for an SEO job at Omi’s company and you tell Oni you say you are content only or technical seo only, you won’t get the job. Omi had someone ask them about doing a technical SEO, do an audit. Omi then shared the full details of the site when he used OnCrawl to analyse it. Content is king but only when Google can see it. Omi crawled their site and there were 500,000 pages in the structure, but out of this, 154,737 orphaned pages. And out of this, only 3,108 orphan pages were active. Why do you have so many orphaned pages when only 3,000 are getting traffic. Your content is useless without traffic. Then Omi asked the developers to get rid of 60 percent of their content. After that, the rankings of the website, spiked up almost immediate. Single handley increased revenue by 22 percent. Did not write a single piece of new content. Did not do backlinks. AMP – early adopters of AP are hugely benefiting. Some companies 70 to 100 percent increase in rankings and traffic and in some cases revenue. Omi said in last 5 years, more technical issues launched by Google. Not content. Internal Linking – very important. Daily Mail wrote about world cup, but never linked to their world cup hub page. BUT then Daily Mail were not ranking for this. Guardian on the other side, linked to their hub page in their articles about World Cup. They were ranking. Many people think hub pages are only important for hub pages for news sites. This is not true. Make sure you clearly define your category pages so they rank for top level keywords. If you business is motorcycle helmets, optimize your category pages for the motorcycle helmet. Compete with your competitors, not yourself. Google has no problems crawling both. But Monster.co.uk, they increased their online visibility in one week. Migrating subdomain to subdirectory, improve internal linking and user experience. This is typical technical SEO tasks. Too often digital marketers are ignoring technical SEO. 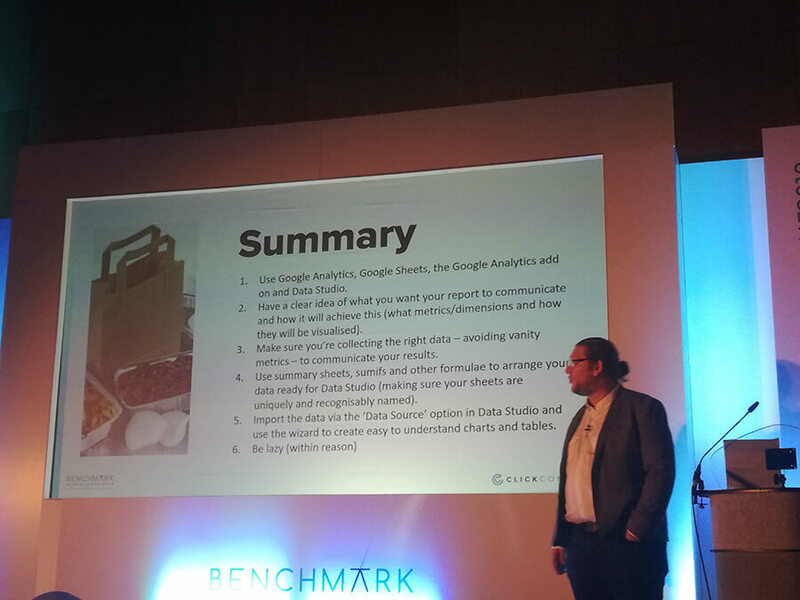 David Karellen, Head of Paid Search, Click Consult talked about Machine Learning. After Sept 2017 there were more limited options for PPC. This goes against Machine Learning. Not all conversions are the same, you have micro and macro conversions. 1 – Google solution is not complete. Need to build your own tools or use a third party. 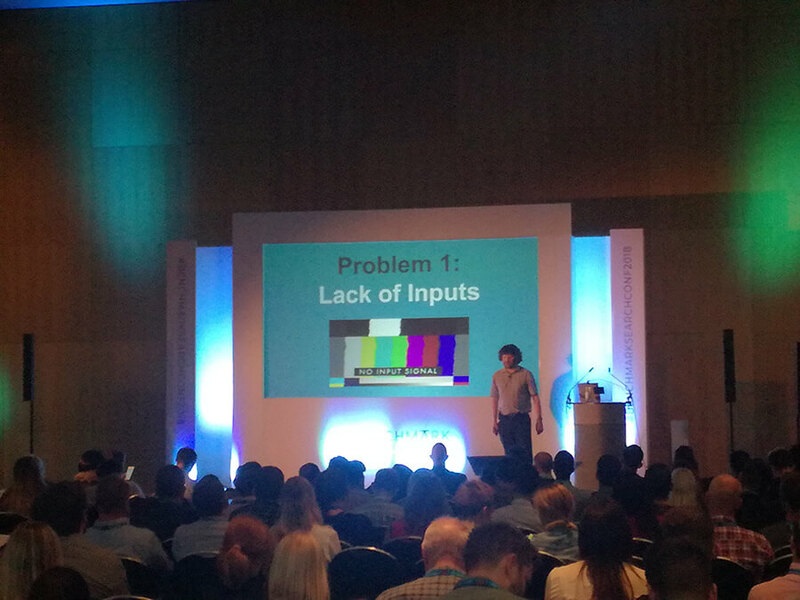 Second biggest issue with Machine Learning, lots of black box activity with PPC. Do not know how it is working. Without knowing the process behind, how do you know what to pick. So test test and test. Google Black Box – the Google Conversion Optimiser, we did not know how it worked. Not much knowledge about the inner workings. If everyone is using the same methods, who wins? Use tools to convert search term reports to search “word “ reports. This can help you spot trends. Data driven attribution model uses machine learning to attribute value to multi step conversions. Need to use data driven attribution. Last click attribution has ended. DDA (Data driven attribution model). 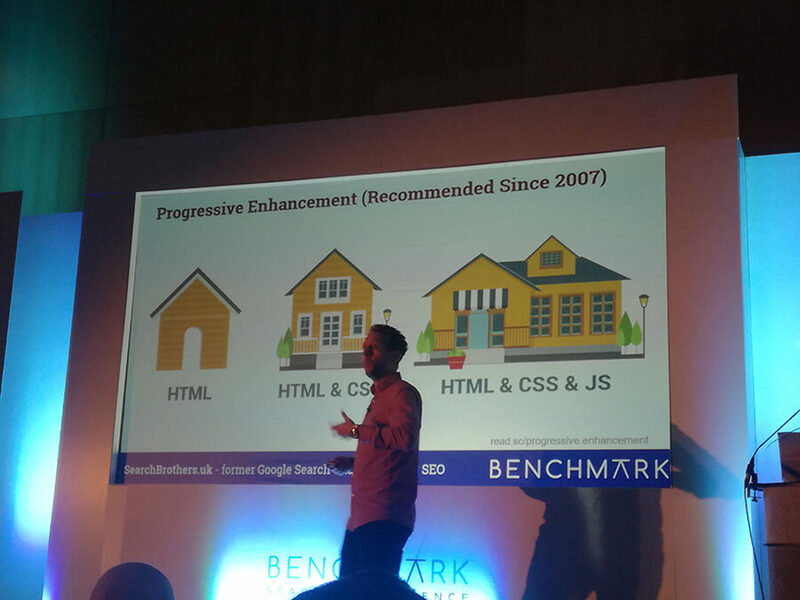 Sabrina Garufi is an agency development manager at Google and gave an insightful presentation at Benchmark. Sabrina said that every day, we are creating 7 times more data than in 2010. Now almost of all us wake up and touch our mobile phones. Smartphone adoption has more than doubled in past 4 years. We are not just going online, we are online, all the time. We are no longer in a mobile first world, we are in a mobile only world. What we see still is our users and consumers are not always matching up with advertisers.Fewer than 50% of businesses in EMEA have mobile optimized sites. Our lives have changed and how we interact has changed. 8 billion connected devices in the world. We are increasingly curious, more than before. “What is the best toothbrush”. Or you are talking with your friends about a movie but do not know the actor. You all get out your phones. More demanding consumer. People are dropping the “near me” in searches. People are impatient. For example there are two times more searches for same day delivering. How are we keeping up with this? So these assistants, it is now a digital strategy. Technology should enhance the customer experience. Computing has undergone major paradgim shifts every 10 years. Machine learning is a part of AI. CEO of Google said we are no an AI first company. Ocado, they are using Google cloud with their email. Google cloud and machine learning, they can scrub the sentiment of the email and bucket them differently. £100 a month but saved £10,000 per month because of this. Remember who are speaking to and what they are expecting. Things move v quickly now. 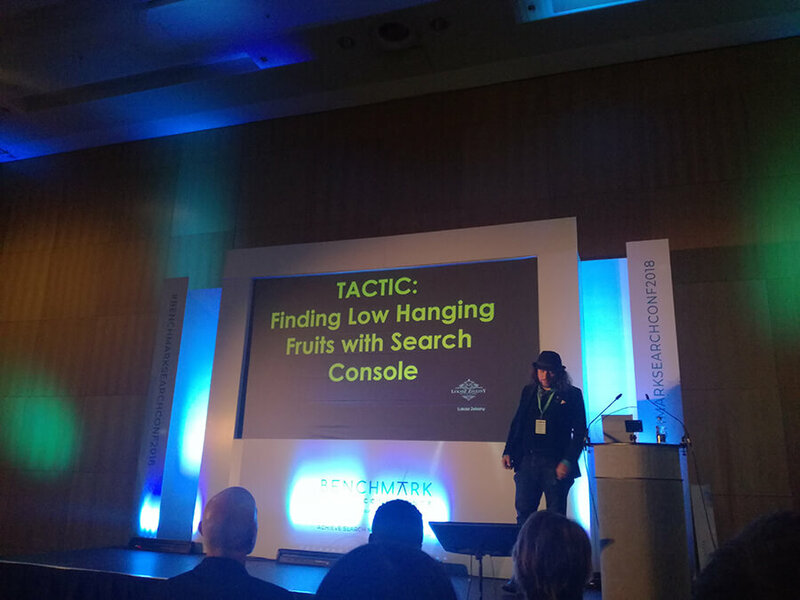 Lukasz Zelezny Director of Organic Performance shared his tactics on how to win in SEO. Get more set of keywords when combine with Google Data Studio. AccuRanker is a good value for money, tracks Keywords. Add keywords and then you get the results. This is a method where there are gaps in your content and how website is built. Think about your competitors and where they are ranking for what content and why your site is not. Can use this method as a way to write about something. Brand24 specify the keywords you want to track. Lukasz says when there is a mentions, he puts the post on Twitter and then asks for a link back. TO help with performance or leveraging traffic. OneSignal – this is free web push notifications. WPA SEO Auto Linker – you can se orphan pages. So can help build net of internal pages. And keep consistencies with the internal linking. Smush image compression and optimisation the free version is very good. Gonzales plugin – About page speed optimization. Auto optimize – this is not to be used with Gonsales, just one or the other. Append Link on Copy – when user goes to your site, they can take this copy, it will take a link from your site. Lots of big publishers are doing this. Siteground – v good at optimising for page speed. If using WP Engine or another clouding providers, go there what you have in terms of cache or php. Your competitor is a great source of data. Fili Wiese from Search Brothers gave a great talk about the input that goes into the Google Search Engine. Talking about input that goes into the Google Search Engine. Server errors are important. Eg if send a lot of 503 errors then google will ask if the Google should send uers to the site. Bots are v conservative. They do not want to slow down the user experience to your users. Test how fast your website is, so use chrome. Google bot is an older version of a custom chrome. No website is the same. URL scheduler = not every URL gets crawled the same. Some get crawled more than others. Majority of the crawl budget goes towards the repeat crawls. How do we help Google priorise the crawling?? 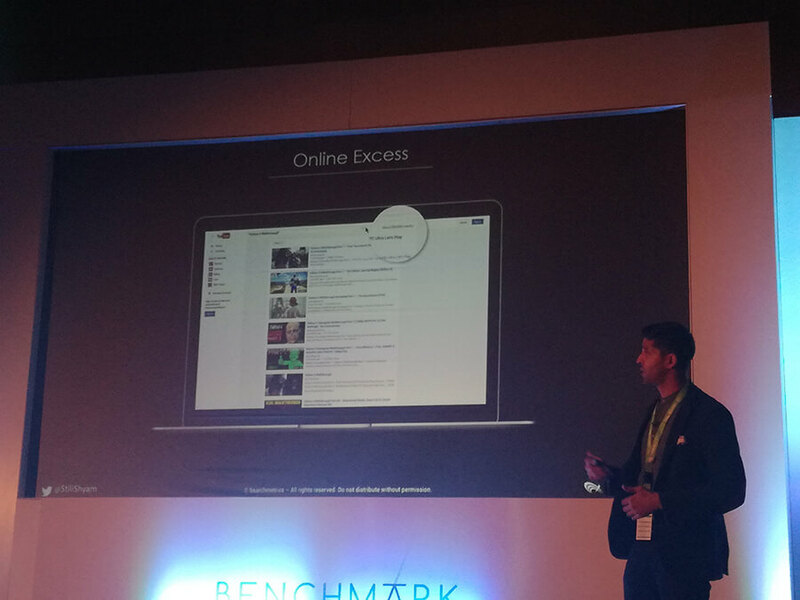 If get enough external or internally pages, shows which pages are more important. Use breadcrumbs give Google good idea of structure of the website. Breadcrumbs do not need to be in the top of the page. Make sure that Google can crawl your page. Blocking a url does not mean stop indexing. Need to also send the right server signals. Soft 404 that is when have a 200 response but should be a 404 response. If you get too many soft 404s, then Google will not trust you as much and not crawl as much. Make sure the content quality is good. Get rid of URLs that do not want to be indexed them. So use the no index. Also stop linking to them. Every page that is indexes, then need to make sure that page stands out. Duplicate content due to multiple languages. (localization). Do href lang. Canonicals are not the same as 301. Google can ignore the canonical. It does not ignore the 301. Then Google will look at your sitemap. Helps prioritise what URLs to crawl. IF you have not yet moved to https. Do not do it yet. Wait to ove cause en though browsers say not secure, but you have the opp to improve SEO signals before migrating. When you do move, Add a;; site map to Google Search Console. Google has been trying to do mobile for a while. AMP Is a separate concept. We just got rid of the m.dot and now we have AMP. If we go AMP, do we want to get rid of M dot. Content parity needs to be the same non mobile and desktop. Check the mobile usability report in Google Search Console. Do we need a separate URL to print content? No. Avid too many unnecessary URls. So stick with the web standards. Make sure optimize for mobile first. 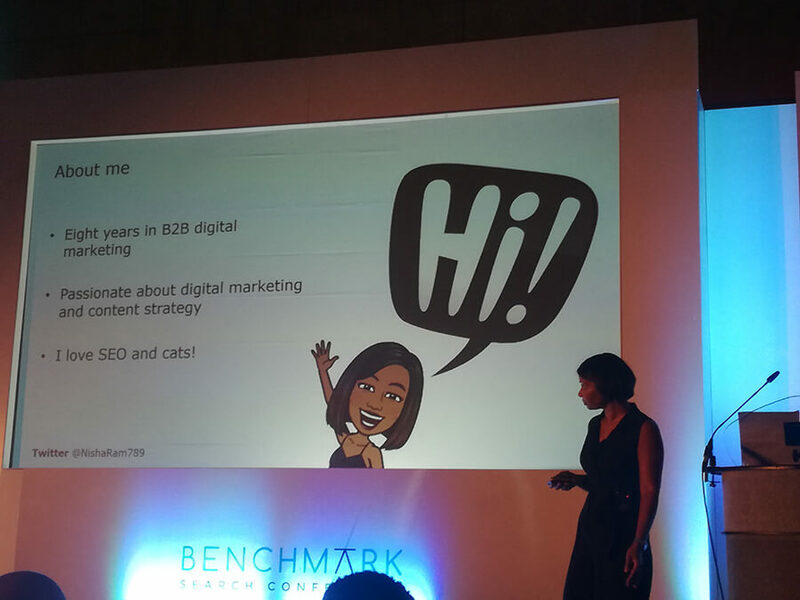 Nisha Ram Digital Strategist from Deloitte talking about how SEO and Content Marketing go hand in hand. And have a fully optimized mobile./responsive site. We do keyword research. WE research more than just keywords. Increase their blogging capabilities and improve the platform. Their people are their best asset. John Warner, Marketing and Content Executive at Click Consult shared his tips on how to automate your Google Analytics reporting in 5 steps. What do you wan to achieve? Page level – this is more granular, you can drill down more. You can look at the page title. Put summaries in the data. 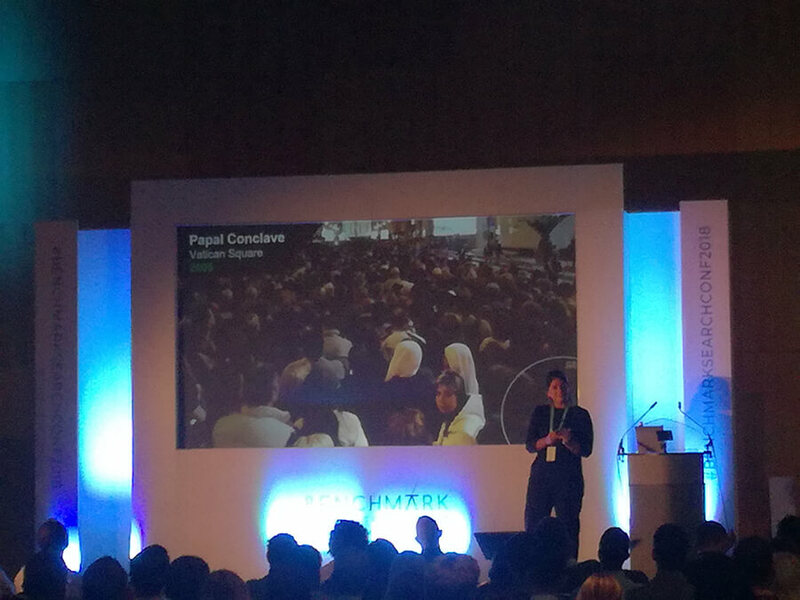 Victoria Olsina shared her tips on page speed from her experience working at Barclays. July 2018 – See update, google starting using mobile page speed as a ranking factor in search results. Who is responsible for page speed? Everyone. Who are the others that have to persuade to get this done? What is the commercial benefit of the project? How are our competitors doing – ? Need to ask what is the commercial benefit of upgrading from 10 to 4 secs? Put in a revenue figure. Then put the roadmap linked to the lighthouse index. Governance and reporting – page speed is never finished. 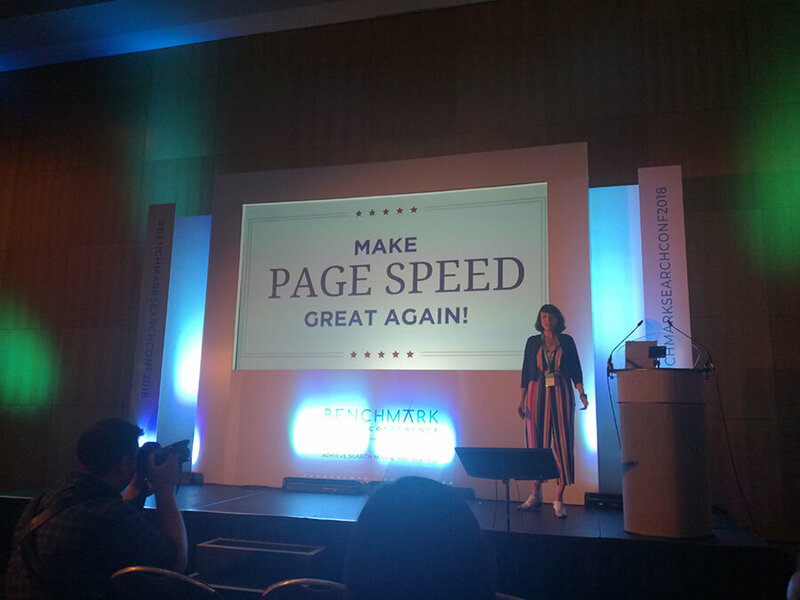 All new pages have to be built with the standards that we defined as best in class for page speed. Ben Irons, Digital Marketing Director of Not on the HighStreet wants us to balance the digital marketing landscape and navigate through the complexity but how can we do this? Are we in danger of overcomplicating our personal digital eco systems and have we forgotten what our main objectives were in the first place? How do we build a framework that will lead us to success? What data is actually of value, can we access it, are we using it in the correct way? Are we measuring what is relevant to our business? How are we spending out time and is it paying back? Need to learn about what we did. Are we evaluating our Time? Don’t lose sight of the original objective and get caught up in the complexity of the Digital marketplace to get the best campaign results. All good campaigns are built on strong foundation and from implementing and updating the basics. Follow a simple strategy and breakdown the goals and actions. Use the data that appropriate to facility achieving and make sure it can be accessed. Measure accordingly and spend time as a group on the initiatives that will get results. Being customer first means listening to what customers are telling you as well as the data you can gather from their behaviour. 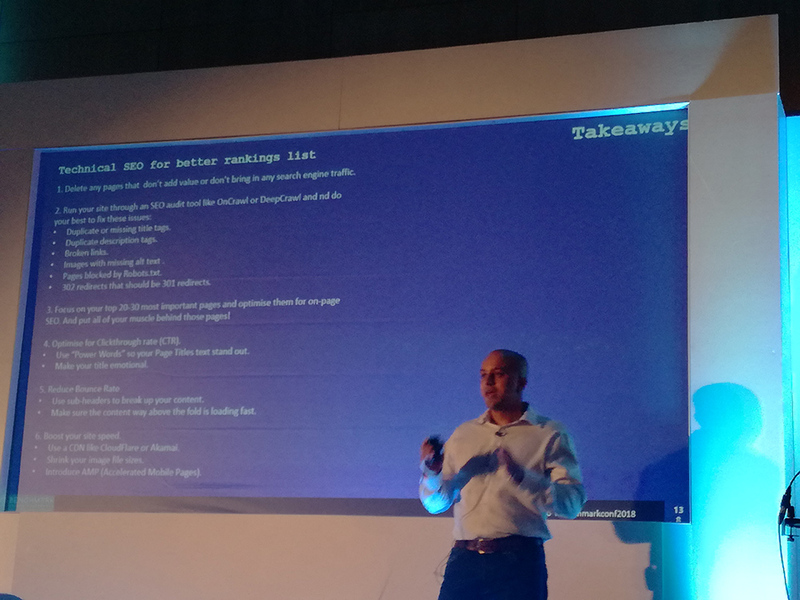 Shyam Dattani from Searchmetrics spoke about using data to help the user and drive more traffic to your site. What is it? Think about the user. Is this benefiting the person coming to the website? So how can we be User-Centric? People did not come to your site to admire your work, they came to accomplish what they wanted. What is the user after? How are they coming to you? (Tofu, mofu, bofu) How are they coming to the funnel? Top of funnel, middle of funnel, bottom of funnel. Where am I not ranking? How and where are they searching? How can I serve the content to best meet 1 and 2? Online your content is your sales person. Answer the questions your customers are asking. Make sure the content Is relevant. What should you be helping with them next. Content is relevant when it provides answer to as many questions as possible and the it deals with the mot important aspects of a topic. The best way to serve the content depends on the internet. For example if looking for recipes, then will want different content than if you were looking for a watch. 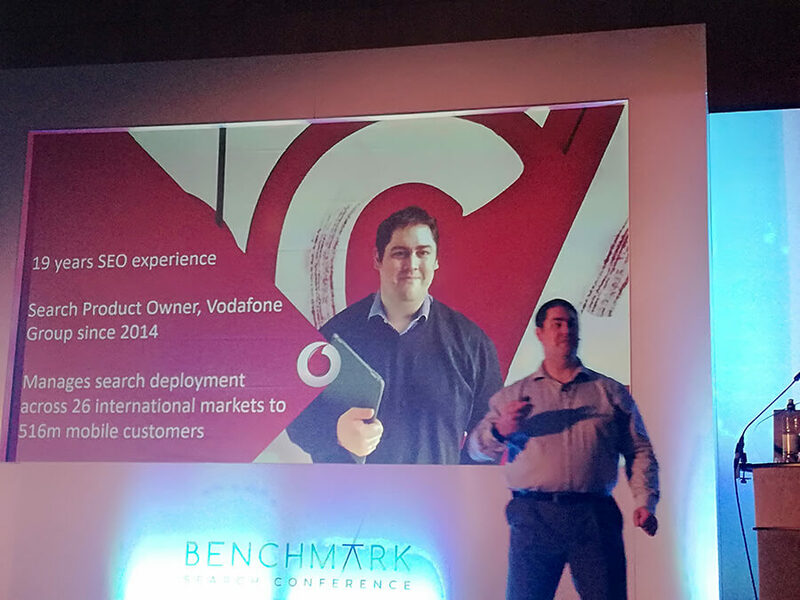 Nick Wilsdon from Vodafone shared his insights on the growth of voice search, particularly with Alexa. Amazon Echo and Google Home are the two biggest ones in US. Voice device skills are on the rise. Now there rare more than 30,000 Alexa Skills available in the market place. Will Amazon maintain their market lead? Amazon has pioneered and led commence excellence. Alexa, ask Vodafone how much is my bill? But be easy to remember. You cannot change this ever. Alexa requires brand ownership documentation for single terms but allows invocation name duplication. Use your data to optimise these quests, eg SEO tool data, Google Keyword Tool, Internal search data. Pay close attention to your comments on the Amazon platform. Early adopters are rating to help make skills better. 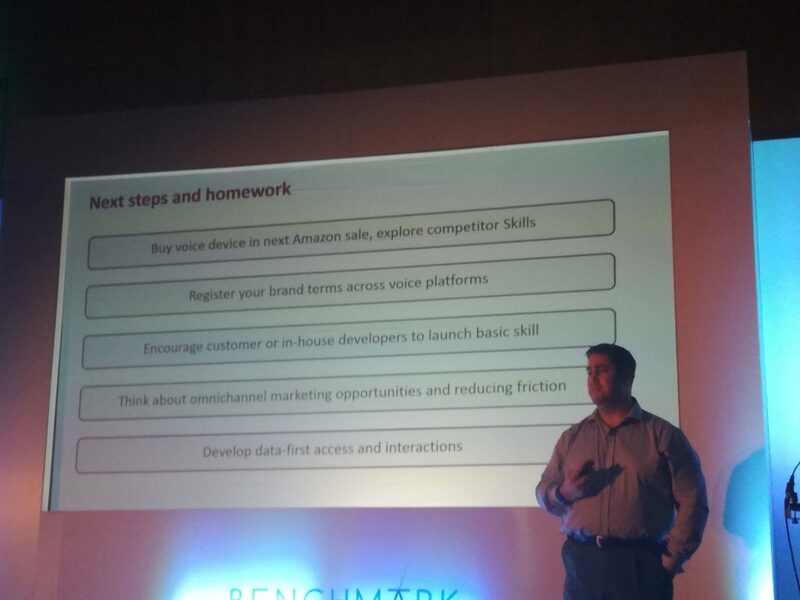 What makes a good strategy on Alexa? Is Voice search over hyped? What is the key? It is an auxiliary. Will allow you to build connections and even asses viability of Amazon B2C or B2B service offerings. Users are positive about voice search. They bought the devices and bought into the system. Brands have the services and data points needed within two take user skills to the next level. Does voice live up to the hype? 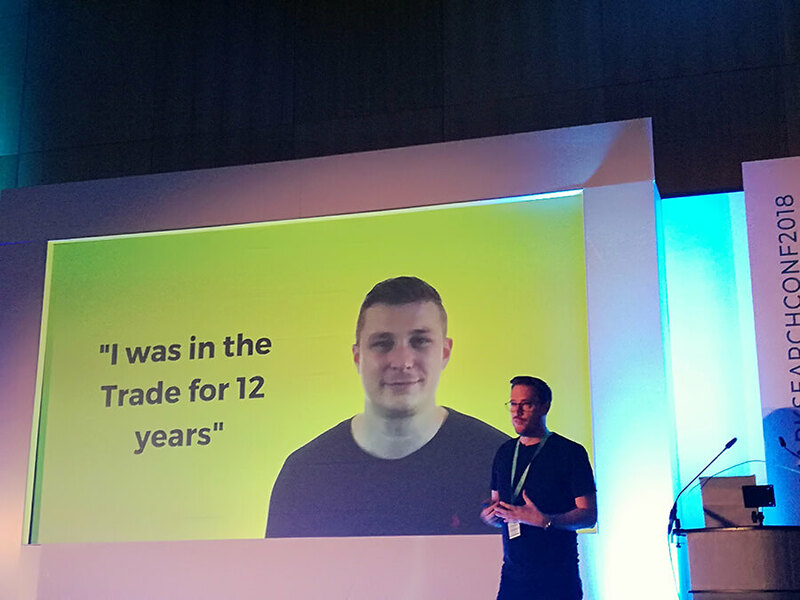 Berian Reed shared his tips in building a global seo team. SEO is not a silo, it is a multi disciplinary team. Agree on the SEO team at pitch stage. Ask about high staff turnover. Treat your agency as an extension of your team. Trello and slack. Brand values – what sets the business apart from the competition? Does your website says this?